In astrology, the element of water represents our emotions and our talents of the imagination. Water characterizes the realm of vision taking us into the quintessential depths of feeling where intuition is more appropriate than acquired wisdom and knowledge. We get ‘carried away’ on water. We have feelings of floating or being ‘adrift’ over water. when looking a the shimmering surfaces of water we cannot see to the bottom, but we know and sense what is there – deep things too obtuse and transitory to explain, fathoms of moods and insight. Water is the element of the signs Cancer, Scorpio and Pisces. The planets of water are the Moon, Pluto and Neptune. When the Water Element card presents itself in a spread, you can trust what you feel as the best course to follow. What you are sensing right now may not be based on any logic, it’s just that what you are sensing is correct. Right now, it is best to go with the flow and, depending upon the cars surrounding it, to trust that movement, although these changes may seem gentle and gradual. 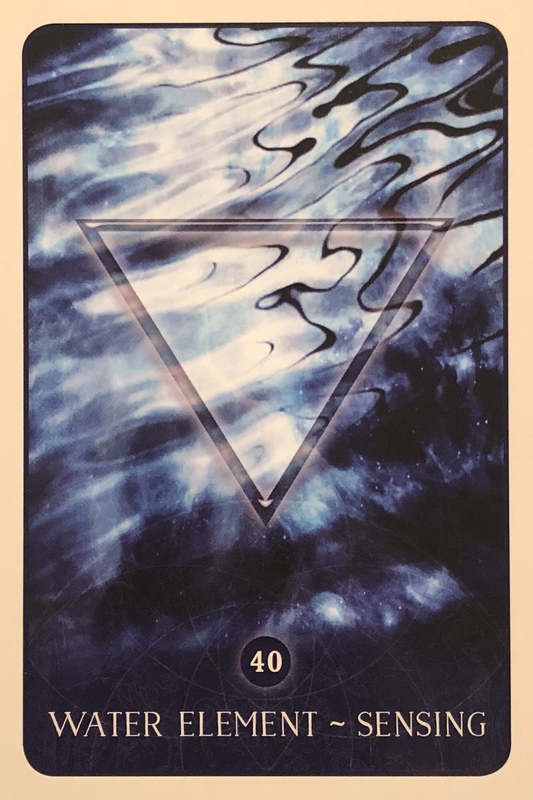 Sometimes the Water Element card indicates a need to withdraw and fight another day. It is time to gather resources and gain strength before moving ahead. This can at times indicate trusting too soon or the passive acceptance of other people’s shortcomings when you shouldn’t accept them. You may have the tendency to want to allow things to pas you by without fighting for them, to let go of something that is rightfully yours. Water is the element of compassion and understanding. But avoid being a doormat. It is possible people or forces may take advantage of your benign and accepting nature. This is a good time to imagine, write, paint, play or create anything, since water is the element of the imagination. It is the ability to quiet your conscious mind and allow yourself to be taken over by an idea or a dream. Water is painting, poetry, and music. This care represents being connected to the flow of all things. It is also the ability to keep a secret or to work alone in privacy. It is probably best to now allow people or circumstances to not pin you down or hem you in. Frankly, you now have the ability to flow or drift out of any situation in the way water is able to move around obstacles very gently and easily. Currently, you may also have the feeling of floating or being adrift. In a sense, it is a type of surrender. Maybe it is the surrender to a dream. At present, you may have little energy and want to withdraw. You are in fact doing a lot of inner processing which will take you where you want to go. There are deeper levels working and developing inside you, but the work is not seen on the outside. Expect a pause but forward motion soon. There is a difference between trusting in your feelings, your gut instinct and your intuition, and getting caught up in your emotions. When we can tune in and look past the drama, the hurt feelings, the fear or the doubt, we can tap into what is really going on here. The ego gets caught up in right and wrong, who said what, and how we have been mistreated. The heart will tell us who we can trust, what feels light and high vibrational and what feels heavy or low vibrational. Where the ego may seek revenge or fear repeating old patterns, the heart can help us to move past the old pain and see something new. This may be an emotional day for you, and that is ok. Honour your feelings, but do not get swept away with them. Maybe it is nostalgia, maybe it is pain from a rejection or finding out something hurtful. Maybe you can’t quite pinpoint the reason for the feelings, but there are present regardless. That is ok too. Sometimes we just feel isolated, lonely or anxious, especially with all the pressures of the present times. Give yourself some time to process these feelings, rather than trying to ignore them or stuff them down. Don’t fight your emotions, just be with them. See if you can breathe through them, and imagine yourself rising above them, surfing the wave instead of being dragged down below it. Use this time for reflection and for the necessary healing.